–The world of Special Operations Forces (SOF) is a tight-knit community, none as tight perhaps as the brotherhood that makes up the Army’s 75th Ranger Regiment. Falling under the purview of the United States Special Operations Command (USSOCOM), the elite regiment is comprised of four battalions – 1/75 at Hunter Army Airfield, Ga., 2/75 at Joint Base Lewis-McChord, and 3/75 and the Regimental Special Troops Battalion (as well as the Regimental Headquarters) at Fort Benning, Ga. The few thousand Soldiers who make up the 75th Ranger Regiment are not only brothers in arms, but also brothers for life. When Charlie Company, 3/75 Ranger Sgt. Jimmy Regan died in 2007 as a result of an improvised explosive device (IED) in Northern Iraq, his father, Jim Regan, experienced firsthand the cohesiveness and camaraderie that hold the Ranger community together. Not long afterward, he was inspired to begin a foundation in his son’s memory. That foundation – The Lead The Way Fund (LTWF) – is a 501 (c) 3 non-profit organization that serves to help active-duty, fallen and wounded Rangers and their families. Beginning next year, it will also be an available charity choice for the government’s Combined Federal Campaign (CFC). Also in the works is a Ranger Children’s Program, which will focus on the needs of the children of fallen and wounded Rangers. During fiscal year 2011, the LTWF provided more than $260,000 to Rangers and their families, providing, among other things, a hospital bed for a Ranger with a severe head injury; a retrofitted car for a Ranger who had lost an eye; and travel for family members to visit their wounded loved ones. The Lead The Way Fund wants Rangers and their families in the JBLM area to know that the Fund is there to help. 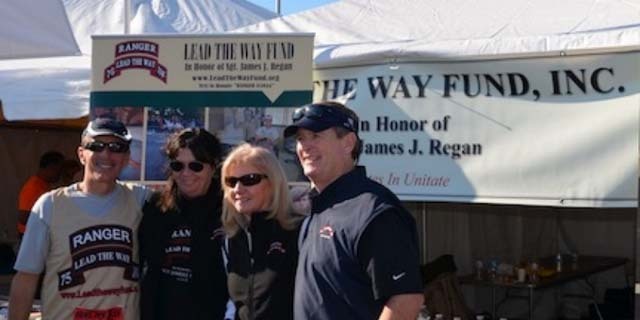 For more information or to donate, visit www.leadthewayfund.org.